O/o the Deputy Commissioner Kamrup, Amingaon. 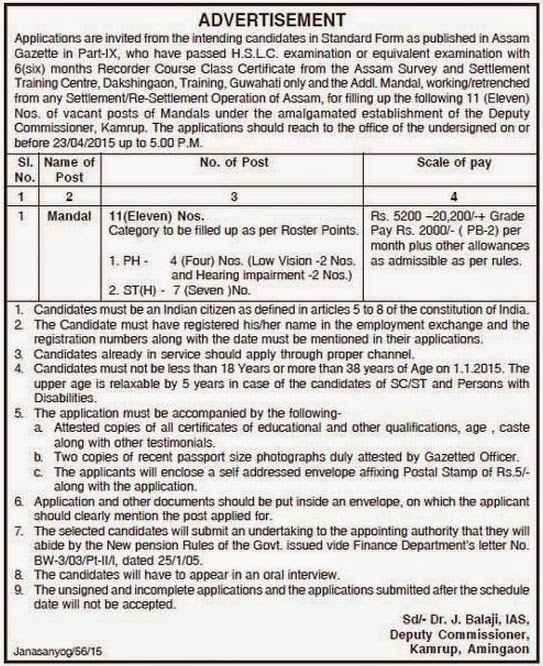 Applications are invited from the intending candidates in Standard Form as published in Assam Gazette in Part-lX for the following post under the establishment of Deputy Commissioner Kamrup. Pay: Rs. 5200 -20.200′-+ Grade Pay Rs. 2000′- ( PB-2) per month plus other allowances as admissible as per rules. Educational Qualification: H.S.LC. Examination or equivalent examination passed with 6(six) months Recorder Course Class Certificate from the Assam Survey and Settlement Training Centre, Dakshingaon, Training.